Our Holistic Formula - Especially for Your Furry Friends! NUPRO® All Natural Ferret Supplement is a "real" meat and vegetable product specially designed to provide balanced levels of protein, vitamins, minerals and digestive enzymes to fortify your pet's typical processed diet. 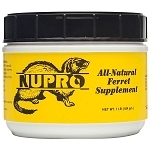 NUPRO® All Natural Ferret Supplement is excellent for all ages from Kits to Adults! If you would like more information or a Taste Sample of NUPRO® All Natural Ferret Supplement please call 1-800-360-3300. Treat Your Furry Friends to a Healthier Life! Norwegian Kelp - Good for the bones, teeth and muscle. Brings out highlights in coat color. Source of iodine and trace minerals. Nutritional Yeast Cultures - Helps your pet to maintain a full and healthy coat. Great source of B Vitamins. Desiccated Liver - Our fresh, natural, real liver creates the ultimate in palatability. Supplies iron and enzymes. Amino Acids & Enzymes - Act as blood builders and help to support a healthy Immune System. Organic Whole Ground Flaxseed - Promotes a lustrous, full coat. Provides essential Omega Fatty Acids that are rich in lignans. Garlic - Helps to fight parasites in the intestinal tract, in addition to many other health benefits. Lecithin - Supports healthy brain and liver function. Calcium Citrate - Intended to provide nutritive support for healthy bones, teeth and nerve function. Lactobacillus acidophilus - Enzymes to help your ferret digest his/her food better. Promotes friendly bacteria in the gut. MAKES A GREAT GRAVY - Just Add Water! Daily servings can be split between feedings. Amounts can be increased as desired. Copyright Nupro Online Store, Inc. All Rights Reserved.